Bakelite (compression-moulded phenol formaldehyde), stainless steel, woven cloth. Wells Coates, the architect and furniture designer, was born in Canada in 1895. He designed furniture for the British furniture manufacturer Pel and designed the Lawn Road flats in Hampstead, London. He died in 1958. 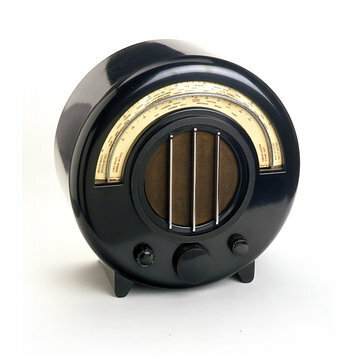 In this radio design he exploited the properties of Bakelite and did not disguise the machine with cabinet-work. This model, which uses brown plastic to simulate burr-walnut, was more popular than the more industrial black plastic version. 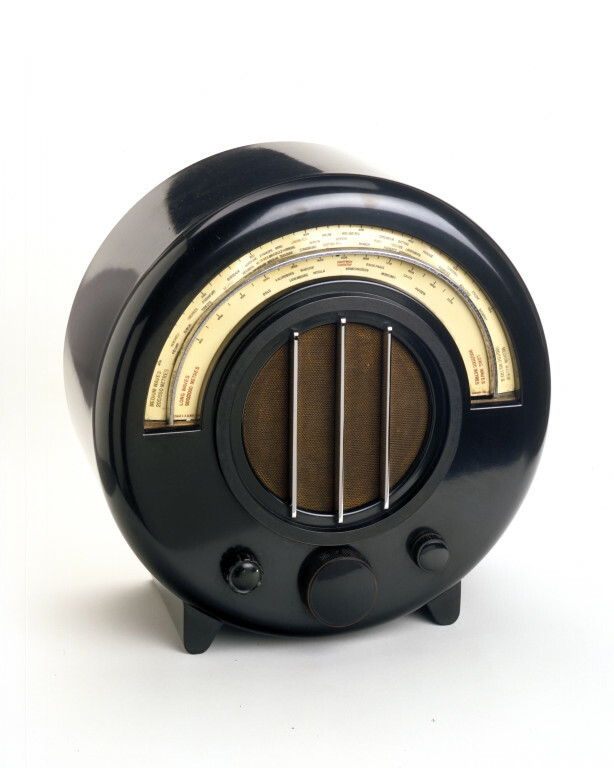 The severe geometric shape defined the visual vocabulary of radio design for many years and Coates produced several variations on this before 1945. Radio, or wireless mechanism contained within a moulded dark brown Bakelite (phenol formaldehyde) case. The circular case sits on two incorporated feet running the thickness of the case. The front of the otherwise smooth case has a raised rim with grainy texture forming a circular frame for a cut-away central section. This contains the circular speaker, which is concealed behind a woven fabric screen. Over the fabric are laid three vertical stainless steel bars which are invisibly attached to the case. Below the speaker are three circular tuning knobs, two smaller ones symmetrically positioned either side of a larger knob. The rim of the knob on the left hand side is moulded with deep grooves, whilst the other two have densely ribbed rims. Another semi-circular section is cut out of the upper half of the case, revealing the tuning dials for the wireless behind it. A fourth stainless steel bar separates the long- and medium-wave dials. The dark brown colour of the moulded Bakelite case is intended to simulate burr walnut, but otherwise does not attempt to imitate cabinet- or wood-working techniques. Bequeathed by David Rush [81/695]. The expense and considerable size of early radio receivers, which imitated cabinet furniture, meant they were status objects in the home. Technological advances, coupled with the introduction of plastics, allowed more compact sets. In 1931 the BBC built Modernist studios (some designed by Wells Coates) and radio style followed suit. Coates, who designed furniture for Pel and flats in the International Style, won this commission in a competition. In this design he exploited the properties of Bakelite and did not disguise the machine with cabinet-work like the Lissen cabinets of the same date. Ironically, this model, which uses brown plastic to simulate burr-walnut, was more popular than the more industrial black plastic version. 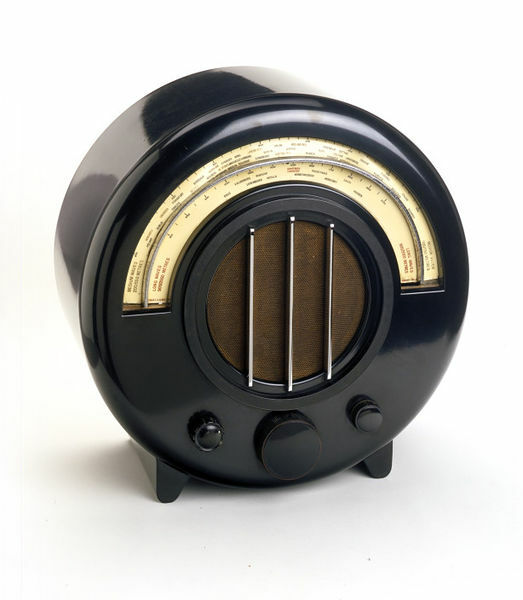 The severe geometric shape defined the visual vocabulary of radio design for many years and Coates produced several variations on this before 1945. EKCO was founded by Eric Kirkham Cole in the 1920s. The company was based in Prittlewell, Southend from 1930 until the 1970s. EKCO was a major employer in Southend with thousands of people working in the factory, design studios and offices. It was one of the first companies to use Bakelite in the construction of radio cabinets, having failed to find success with 'traditional' wooden wireless sets. The company made the bold decision in 1930 to begin selling plastic cabinets. Ekco had its own Bakelite presses on site, purchased complete in 1932 from German company AEG (Allgemeine Elektrizitats Gesellschaft). EKCO's round radios of the 1930s - particularly the AD 65 designed by Wells Coates became Art Deco design classics. Ekco AD65 cabinets were were formed with intense heat and pressure, using imported German Bakelite presses. The resin had to be compressed with a pressure of over 1000 tons.